This is a quick post to summarize my frustrations about the process of setting up and configuring a BizTalk (2010) environment on a multiple server environment. [WARN] AdminLib GetBTSMessage: hrErr=c0c02560; Msg=Failed to read “KeepDbDebugKey” from the registry. 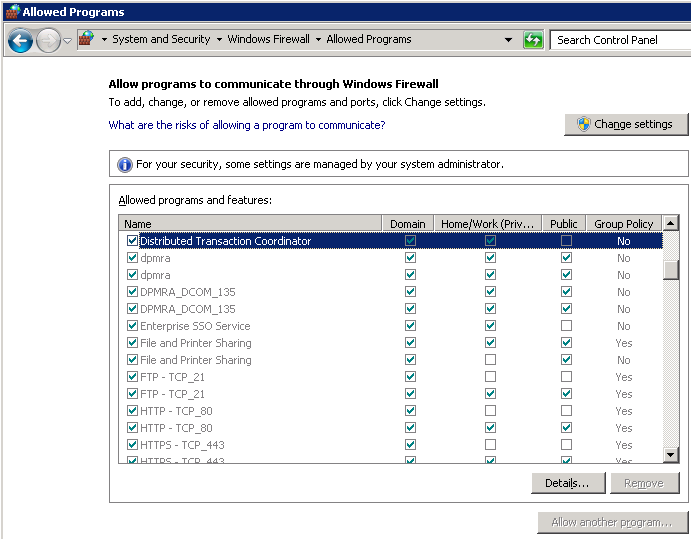 Check that MSDtc has been allowed access through the firewall – again on ALL machines including the SQL server! Check that the SQL Server Browser service is running on the SQL server machine. “What’s the deal with ruining interfaces everywhere? It’s almost like everyone is competing, who will make the worst one. This is so ironic on so many levels… But it’s so true. Lately a lot of things feel like they are moving in the wrong direction (don’t even start on politics…). Thanks to a link on Slashdot (yes, I read that too) I came across an article on Arstechnica about the (possible) future of development on the Windows platform in the future. However, from the leaked (or released) testing versions so far it seems the situation is a bit more complex but perhaps not as bad as some developers are fearing. The author of the article goes on explaining the history around how longhorn was planned but ultimately dropped to support only existing (at that time) technologies. It can only be that the internal politics inside Microsoft causes so much turmoil and the ‘old’ side won. A lot of newly planned technologies got dropped in the process and the result was Windows XP without all those features promised (like WinFX etc). Then that Windows XP and the hackers story started and further derailed any possibility of new technology getting into the core platform. Even now with Windows 7 the .Net framework and related technologies are really only an ‘add-on’ and not used by the core of the OS. This is (according to the article) where Windows 8 is going to change things again – big time! If the article proof to be accurate then there may be some hope for Microsoft still. The problem is just that old enemy – themselves, as internal fighting against change might make things more difficult. However, because of the changes in the market recently (last few years) Microsoft might not have the luxury anymore to just play around and ignore the internal politics. They have been surpassed by several competitors (yes, not just Apple) and survival is not guaranteed anymore. Any bugger-ups now can actually cause the company to go the way of the dodo. They better get it right. Perhaps with this thread hanging over their heads they are taking things more seriously and that is why they are not talking openly anymore about internal changes. The only next planned release of a build of the new Windows is scheduled around September so we’ll have to wait and see if/how things have changed. In a way I can understand why Microsoft would be doing such a thing. They are desperately trying to play catch-up in the market and needs to do more and more radical things just to stay relevant and alive . They have never been strong in creating a development technology and sticking with it. There is too much internal politics and infighting going on. The result is that they are failing faster and faster each time. But don’t count them out yet – Apple was once in that position and jumped back into life. For Microsoft’s sake lets hope they can also do it. Perhaps they must use their billions while they still have some to buy Steve Jobs 😉 – or ask uncle Bill to come out of retirement. I must admit I really like C# so it would be a sad day if I have to hang up my C# ‘gloves’, so to speak. If you are one of the ‘lucky’ ones still using a Windows Mobile 6.5 phone and reading your gmail using the standard imap interface (the default way) then your phone is screwed. Apparently Google made some change on their side that does not play nice with the imap client software on these devices. The result is that the tmail.exe process goes haywire and runs at 100% (or close) of CPU time. This has the effect that the device is first, extremely slow, the battery drains in something like just an hour or two and your gmail is not actually working anymore. Early suggestions to temporarily fix this was to switch the receiving server (protocol) from imap.google.com to pop.google.com but even this didn’t help me. Even setting the refresh polling to manually cause the process to spike which cause the same problem. So for now I had to totally remove the gmail account just to get the rest of the phone to work normally. Hopefully they will fix it soon!